New report provides first-ever analysis of public financing for energy projectsEach year, G20 countries provide nearly four times more public finance to fossil fuels than to clean energy, according to a new report released today by Oil Change International, Friends of the Earth U.S., the Sierra Club and WWF European Policy Office. In total, public fossil fuel financing from G20 countries averaged some $71.8 billion per year, for a total of $215.3 billion in sweetheart deals for oil, gas, and coal over the 2013-2015 timeframe covered by the report. Fifty percent of all G20 public finance for energy supported oil and gas production alone. The report, for the first time ever, details public support for energy projects from G20 public finance institutions (such as overseas development aid agencies and export credit agencies) and multilateral development banks. It finds that just 15 percent of this energy finance supports clean energy, while tens of billions of dollars are funneled to oil, gas, and coal producers annually. The best available science indicates that at least 85% of fossil fuel reserves must remain in the ground to meet the aims of the Paris Agreement on climate change. Yet of the $71.8 billion in fossil fuel finance, $13.5 billion goes to activities that supercharge the exploration phase for even more unburnable reserves of oil, gas, and coal.These findings directly contradict the goals espoused in the Paris climate agreement — touted by these same governments — which specifically calls on countries to align financial flows with low-emission development. 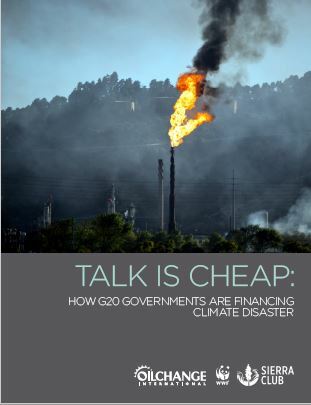 The report, entitled “Talk is Cheap: How G20 Governments are Financing Climate Disaster,” can be found at http://priceofoil.org/2017/07/05/g20-financing-climate-disaster. In addition to the authoring organizations, it has also been endorsed by CAN-Europe, Urgewald (Germany), FOE-France, Re:Common (Italy), Legambiente (Italy), Environmental Defence (Canada), FOE-Japan, Kiko Network (Japan), JACSES (Japan), and KFEM (Korea). Utilizing data from Oil Change International’s Shift the Subsidies database, the groundbreaking report analyzes support coming from public finance institutions — those institutions controlled by or backed by governments, such as export credit agencies and development finance institutions. It looks specifically at provision of grants, equity, loans, guarantees and insurance by majority government-owned institutions for domestic and international fossil fuel exploration and production. It presents a detailed picture of public finance for all energy — clean, fossil fuel, or otherwise. The report shows that public financing for fossil fuels has a three-pronged effect on efforts to address climate change. First, it acts as a “negative carbon price” that helps to subsidize and incentivize more fossil fuel production. Second, it helps drive high-carbon lock-in, making the transition to clean energy more difficult and costly. Third, this public finance makes uneconomical dirty energy economical, thereby enabling “zombie energy” projects that would never even begin operating without such support. “The Paris Agreement should lead policymakers to refocus public finance on energy savings and sustainable renewable energy, which actually offer effective solutions to our future energy challenges,” said Sebastien Godinot with the WWF European Policy Office.